Tunneling for the City and County of Honolulu’s largest sewer project, the Kaneohe-Kailua gravity sewer tunnel, is now complete. The three-mile route linking the Kaneohe Wastewater Pre-Treatment Facility (KWWPTF) to the Kailua Regional Wastewater Treatment Plant (KWWTP) took 13 months to bore through. 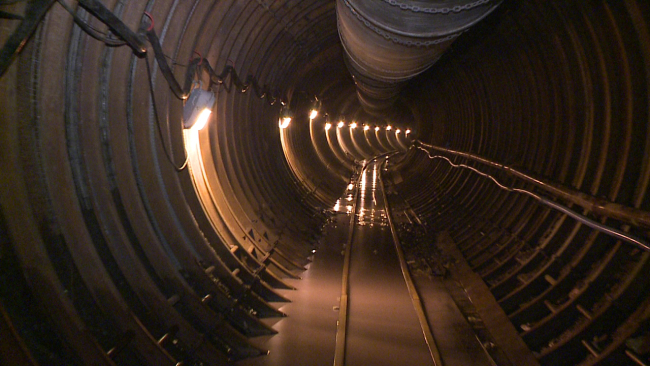 Once complete, the tunnel will send wastewater by gravity flow from Kaneohe to Kailua with no pumps involved. It’s meant to prevent wastewater overflows and spills, especially during storms. “It’s a plus, not only for the island of Oahu, but for the whole State of Hawaii, only because we need to keep the water clean. We need to coral good. We need to keep the fish,” said Don Painter with contractor Southland Mole JV. “Despite this being the largest sewer project in state history, this critical infrastructure project has had very little impact on our residents while ensuring our public and environmental health and safety for generations to come,” said Honolulu Mayor Kirk Caldwell. Next, crews will install and grout a pipeline 10-feet in diameter throughout the tunnel to transport wastewater flows. Pipe installation is expected to commence in August or September. Phase two of the project is installation of a tunnel influent pump station (TIPS) in the Kailua shaft. TIPS will receive and pump the tunnel flows up to the KWWPTF. The third and final phase of the project is construction of a tunnel influent facility (TIF) at the KWWPTF. Upon completion of all phases, the existing force main that transports wastewater from Kaneohe to Kailua will be decommissioned and the flows are expected to be redirected to the new gravity sewer tunnel in 2018.